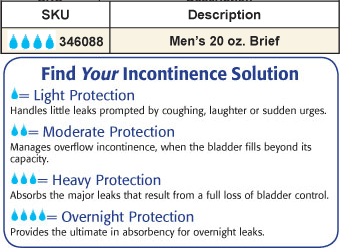 This super-absorbent men's incontinence brief - 20 oz. looks and feels like a regular cotton brief, but it's more—the 5-layer construction will hold up to 20 ounces of fluid. The men's incontinence underwear retains its waterproof barrier even after numerous washings. No more hassling with messy, expensive pads. Cotton, polyester knit is machine washable; USA and imported. 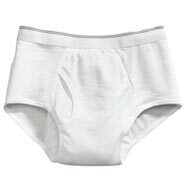 Incontinence Briefs For Men - 10 oz. Incontinence Briefs For Men, Gray - 10 oz. Incontinence Briefs For Men, Gray - 5 oz. After using other products I really enjoy using these briefs on my husband. They save time and they create less problems with leakage. These briefs work well for light to moderate Incontence but I have found that a pair of waterproof pants are needed for heavy useage . I currently have two dozen pairs so I can extend the live of them . My partner can't be without the briefs. Thank you. My partner wears the briefs daily and feels protected. It really meets my needs. I already have a pair and enjoying the freedom I have. if it is worth the price I paid for. Trying for the first time. Good Price. I have a 13 year old son who wets the bed and I am looking for something that will help with this problem. Much better protection than the regular pair. I am trying these for day with long excursions when I my not have a opportunity to cath, and a brief beats any of the adult diapers. For personal and comfortable reason. These work Great for my husband who has had prostate surgery. A little expensive but he says worth it. I have used this type before, and they work pretty well. Because of its holding 20 oz. Looking for leak proof brief. Really helps with night incontinence. I combine with reusable waterproof bed pad. My mattress has never gotten wet. liked description ! Sounded like it was just what I was looking for ! My husband uses these and has for a long time. Time for some new ones. If ever go on sale please let me know. Works better than any other product. We are hoping that this product will be more secure than what he is using now. Out of necessity for my father and this looked like the best product. I chose this for maximum absorbency. I travel by car frequently and long distances. Needed for protection. They work and make my current issue a little more bearable. WHat are the waist sizes of 2XL and 3X, Men's 20 Oz. Brief? Unisex Overnight Protective Underwear pkg. Men's Washable Incontinence Underwear 6 oz. Are the briefs able to go into the dryer? BEST ANSWER: Thank you for your question. Yes they are washable. We hope this information will be of help to you. Thank you for your question.We hope this information will be of help to you. Yes, they are very reusable. It looks like they have a fly opening. Is that correct? My Dad won't wear Depends because they don't have a fly and will make it more difficult for him to go. Is the XL what we need for a size 44??? BEST ANSWER: Thank you for your question. We suggest 2XL, We hope this information will be of help to you. Who makes these briefs 20 oz? BEST ANSWER: Thank you for your question.We are under contract with vendors and we are unable to provide that information. We hope this information will be of help to you.